Fineazy is an AI-powered chatbot empowering excellent, informed financial decisions. We believe financial capability is part of a person’s dignity, yet finance is hardly ever taught in a simple, engaging and accessible way. Until now. 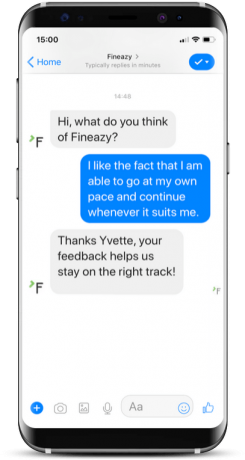 Financial confidence starts with Fineazy. Learning finance doesn’t have to be boring. We’ve created captivating quests, characters and high quality content you can trust. Every person learns in a different way. 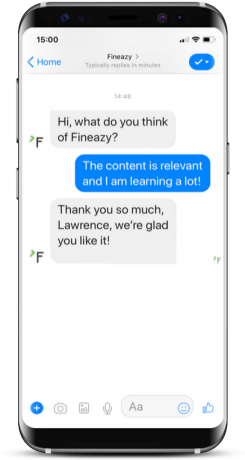 That’s why we use machine learning to give each of our users a unique learning experience. Our multi-platform AI chatbot fits seamlessly into daily conversations. We’ve all got far too many apps anyway.